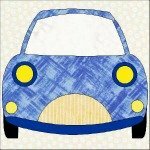 This applique car block is a real cutey! I made this block of the month up in 2012 to use with my quilting group. There were quite a few blocks made that month. One member had her grandson visiting when she was making her block and he loved it. 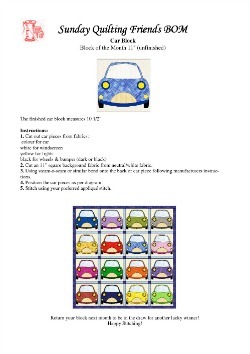 He told her she had to win all the blocks so that he could have a car quilt! No pressure on grandma! As luck would have it she did win all the blocks and the quilt can be seen below. I always make one or two blocks up as a sample to show what the finished block looks like. This also sets the color tone. For this block I used bright and bold color choices. Using EQ7 (quilting software program) I made a quilt from the blocks and added this to the hand out. Again I used the same colors. Each block in the quilt is made 10 1/2" x 10 1/2" finished. You need two main colors for this block and then small amounts of yellow, black and your choice of fabric for the grill. 1. This is a simple applique block to make. I designed this block for raw edge machine applique with your preferred stitch. If you are wanting to turn your raw edges under then you will need to add seam allowances to the templates before cutting them out. 3. 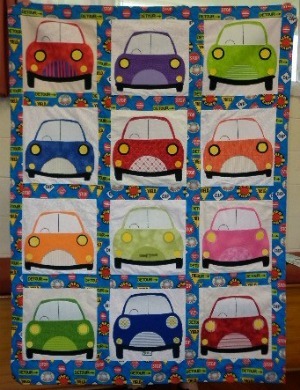 You can find a pattern for a car quilt using this block. I called it 'Go Go Go'.